Freedom in the United States today is a moving target, and when the government catches wind of an innovation that makes life easier and more affordable for ordinary people, it always steps in to take control. Take, for example, the growing effort to outlaw offgrid living in the U.S., as well as moves by local governments around the country to criminalize private rainwater collection. Now, the federal government is making a major move against the tiny house movement, seeking to give the U.S. Department of Housing and Urban Development (HUD) authority to require tiny houses to conform to the standards of recreational vehicles (RV’s), of which one of the rules is that the vehicles may not be used or marketed for permanent living. HUD is seeking to regulate tiny house living out of existence or to turn it into a regulated industry by requiring that tiny homes be manufactured in factories, conforming to codified standards. The tiny house movement is one of the latest innovations in personal freedom from an overly consumeristic and a debt-driven society. Many people construct tiny houses themselves, often but not always on wheels, for a fraction of the cost of typical housing. In a tiny home, one has everything needed to live a comfortable life, but in a tiny space often less than a couple of hundred square feet. They park them in hospitable places and enjoy life without a mortgage and everything else you need to fill and maintain a big American house. This proposed rule would modify the current exemption for recreational vehicles in the Manufactured Home Procedural and Enforcement Regulations. Under the current exemption, questions have arisen regarding whether park model recreational vehicles are regulated by HUD’s manufactured home program. These park models are being produced with patio roofs, screened in porches, and other extensions that exceed the 400 square foot maximum exemption in the current regulations. Additionally, some of these models are being marketed as suitable for year round living. HUD’s proposed rule would permit recreational vehicle manufactures to certify that a unit is exempted from HUD’s regulations. Specifically, HUD’s proposed rule would define a recreational vehicle as a factory build vehicular structure, not certified as a manufactured home, designed only for recreational use and not as a primary residence or for permanent occupancy, and built and certified in accordance with either the National Fire Protection Association (NFPA) 1192-2015, Standard for Recreational Vehicles, or the American National Standards Institute (ANSI) A119.5-15, Recreational Park Trailer Standard. In addition, to provide consumers notice regarding the manufacturing standards used to construct the unit, HUD’s rule would require that units claiming the exemption display a notice that identifies the standards used to construct the unit and states that the unit is designed only for recreational use, and not as a primary residence or permanent dwelling. Whenever innovators and visionaries come up with new ways to thrive in an ever-more oppressive environment, government is certain to declare all out war, and tiny house living is about to be banned. How can you affect the outcome? Read more articles from Isaac Davis. Isaac Davis is a staff writer for WakingTimes.com and OffgridOutpost.com Survival Tips blog. He is an outspoken advocate of liberty and and a voluntary society. He is avid reader of history and passionate about becoming self-sufficient to break free of the control matrix. Follow him on Facebook, here. 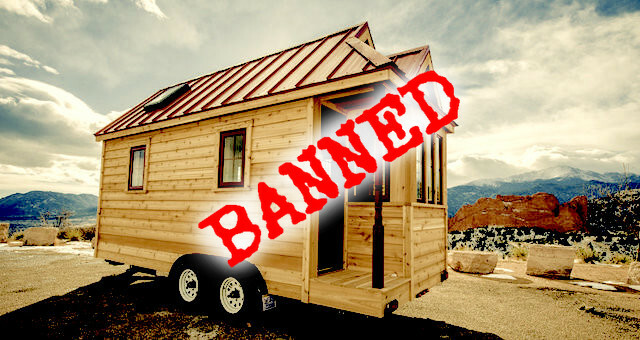 This article (US Government Declaring All Out War on Tiny House Living) was originally created and published by Waking Times and is published here under a Creative Commons license with attribution to Isaac Davis and WakingTimes.com. It may be re-posted freely with proper attribution, author bio, and this copyright statement.